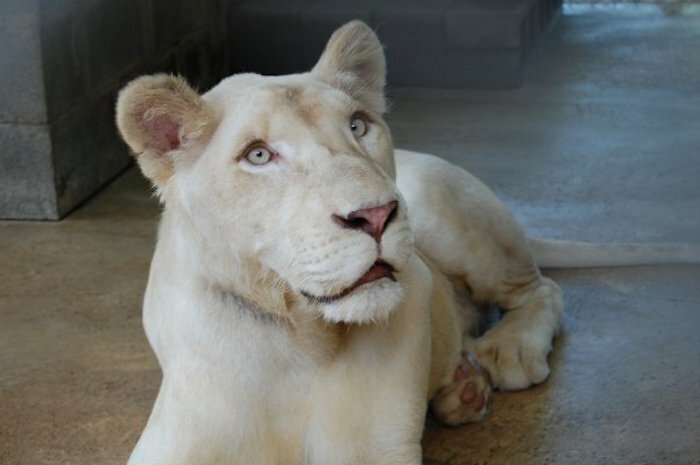 You’re about to meet Sheila the lion. 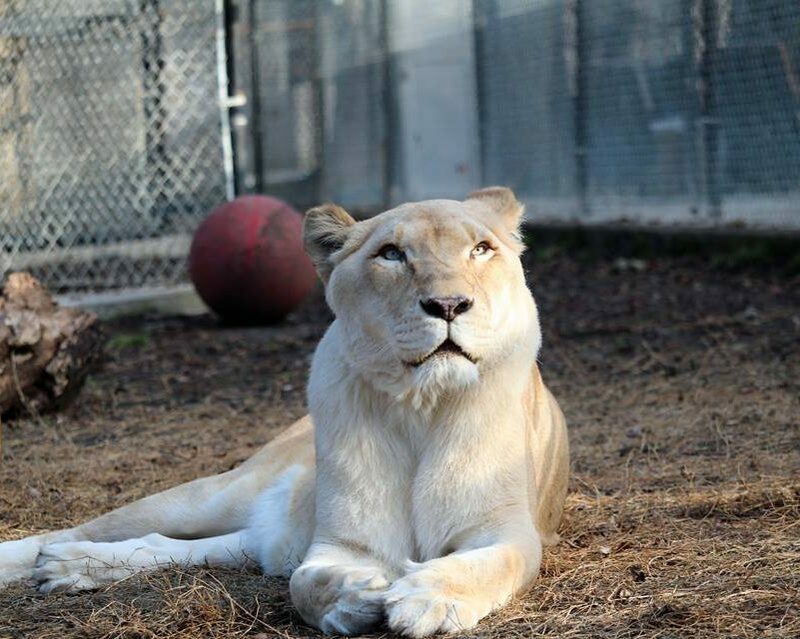 Sheila is a gorgeous lioness who spent most of her life as a show animal performing at private parties. After years of working as a performance animal, her health started to suffer and she started to deteriorate. 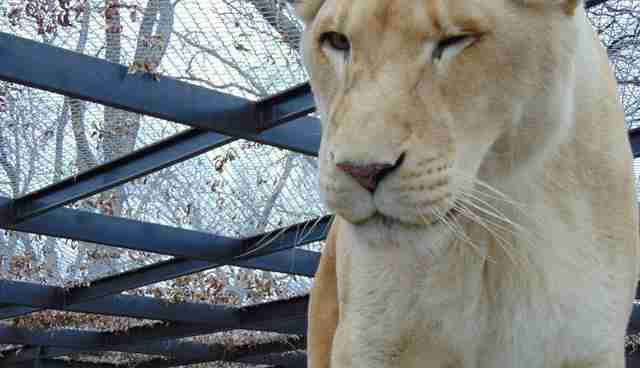 Sheila was one of the lions rescued by the U.S Department of Agriculture in July 2009. 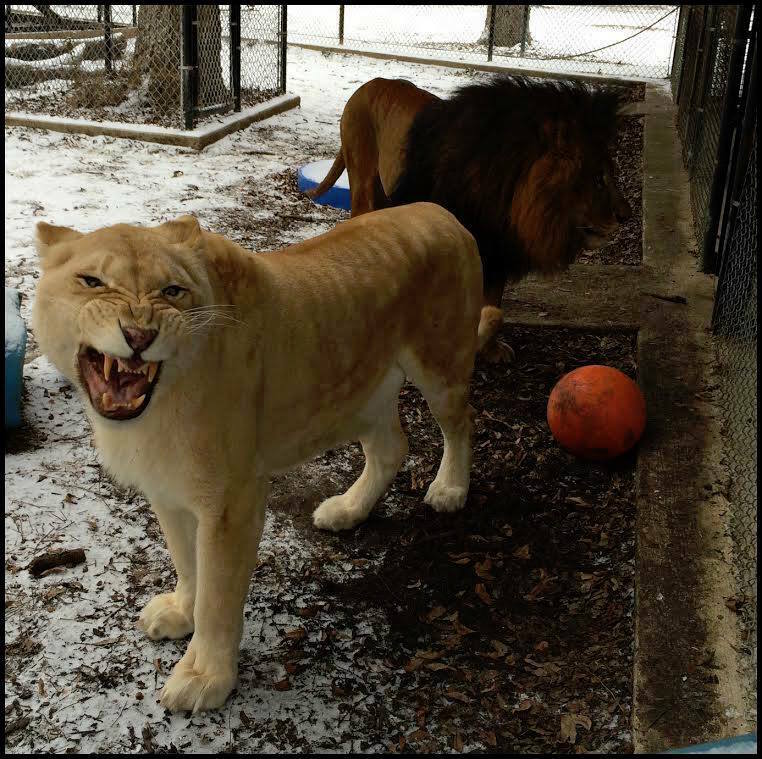 A lot of the lions rescued that year were in poor shape, but Sheila’s condition was particularly dire. She was severely underweight, frail, and weak. Her rescuers thought that there wasn’t much hope for her, but they decided to take a chance and help her anyway. They wanted to at least give her an opportunity to pull through. 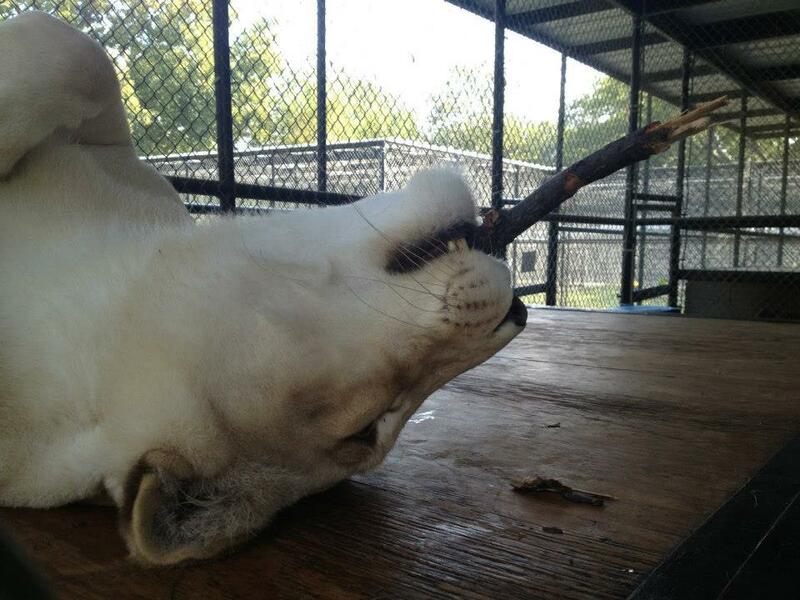 Sheila was rescued from an entertainment center in Texas. Her job was to make her owner a lot of money by performing at high profile parties and events. Sheila wasn’t the only lion at this entertainment center, but she was the lion who had worked and suffered the most. 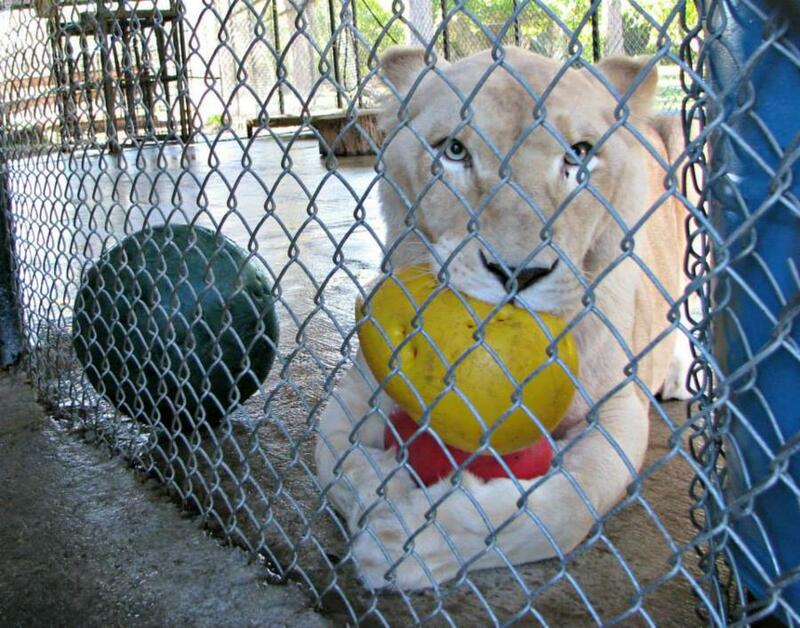 Sadly for Sheila, she had spent most of her life held in captivity in Texas. 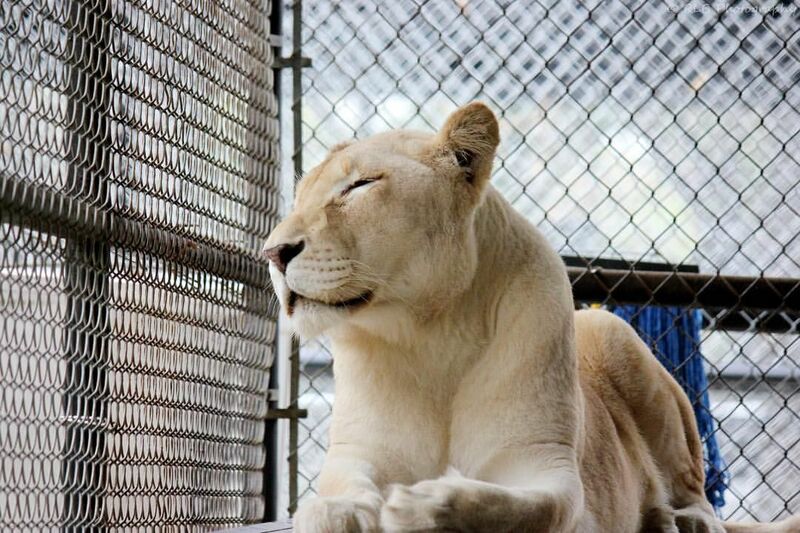 She had been a working lioness since she was just a little cub. She had started living as a pet and appearing in photoshoots, and then she began working in the entertainment industry. Sheila was a wild animal living a domestic, labor-intensive life, and it was taking a massive toll on her health and well-being. Sheila was suffering from a coordination problem, and pretty soon, she couldn’t even stand up on her own. Her rescuers understood that her muscles were weak and it was causing her problems even while she was just walking around. She could hardly lift her head up to eat or to get a drink of water. She had completely lost her appetite and it seemed like she had completely lost her will to live. Unfortunately, Sheila’s story isn’t all that rare. Animals are stolen for entertainment purposes all the time. Famously, the documentary Blackfish exposed fishermen who steal baby whales from the ocean and sell them to places like Sea World for profit. Most of these animals aren’t cared for properly and they end up living short, tortured lifespans. Sheila’s rescuers were hoping that she wouldn’t suffer that same fate. 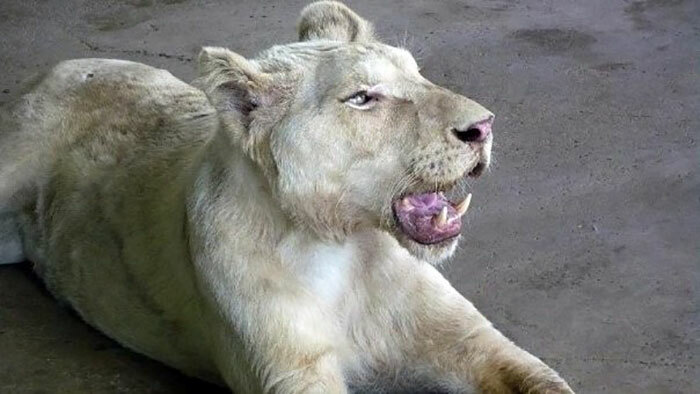 Sheila was in such bad condition that the U.S Department of Agriculture decided to hand her over to an animal social welfare organization known as In-Sync Exotics Wildlife Rescue and Education Center. This is an organization that specializes in sheltering stranded animals and nursing them back to health. The U.S Department of Agriculture told In-Sync that if Sheila’s condition didn’t improve, they should strongly consider euthanizing her. It wasn’t fair to allow Sheila to suffer. Sheila was brought to In-Sync and started settling in. At first, she wasn’t responding well to treatment. Even so, her rescuers were determined to save Sheila’s life. Even though the team at In-Sync was doing everything they could to help Sheila, it didn’t look like she was improving much. Her health seemed to be pretty much the same as it was when she arrived. One In-Sync member said, “She had very little muscle coordination, and thus when she walked, her legs would slip out from under her.” It was going to be a very slow road to recovery. The rescuers at In-Sync had experience working with wild animals in poor conditions before, but they had never seen a case quite like this. It was as though Sheila was refusing to get better. They thought she had given up completely. After days of weakness and lethargy, Sheila stopped moving altogether. She would throw up whatever she ate and it seemed like her health was getting worse. This put the rescuers in a really tough position. The team at In-Sync was at a total loss. They were doing everything they could to help Sheila, but nothing seemed to be working. 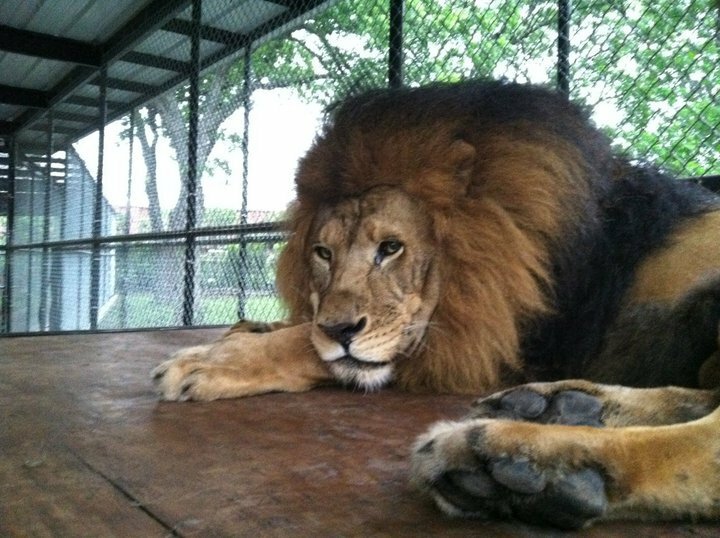 After a few weeks of tireless work, they decided to consider USDA’s advice of euthanizing this big cat. Sheila’s life had become painful and difficult. The team had to face the fact that the most merciful thing to do was to give Sheila a peaceful end to life. The team really didn’t want to lose Sheila. She was a beautiful animal who had spent her whole life in captivity. They wanted to give her a chance to enjoy the life she had left. Sheila wasn’t like other lions. 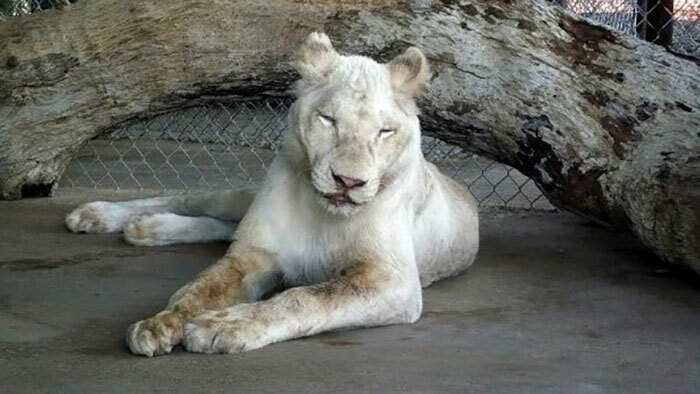 Her fur was very blonde, which made her stand out from other big cats. The In-Sync team had a revelation about this beautiful ion. They figured out that Sheila was suffering from a disease called toxoplasmosis, as well as a lack of vitamin A. This meant that there were parasites in Sheila’s blood. The disease can be fatal for members of the feline family. Now that her caretakers knew what was wrong with Sheila, they just had to get her to take her medicine. Toxoplasmosis is an infection usually found in cats. An animal develops this infection when their immune system is not strong enough to fight off infections. Years of improper care caused Sheila’s immune system to weaken, which is how she developed the disease. Symptoms of toxoplasmosis include reduced coordination, disorientation, anorexia, lethargy, breathing difficulties, enlarged lymph nodes, and apparent blindness. If not properly and promptly treated, this disease can be fatal. Sheila’s caretakers immediately started treating her with antibiotics. It had taken a while to arrive at a diagnosis, and Sheila was starting her antibiotic regimen quite late into her condition, but this was Sheila’s only hope. 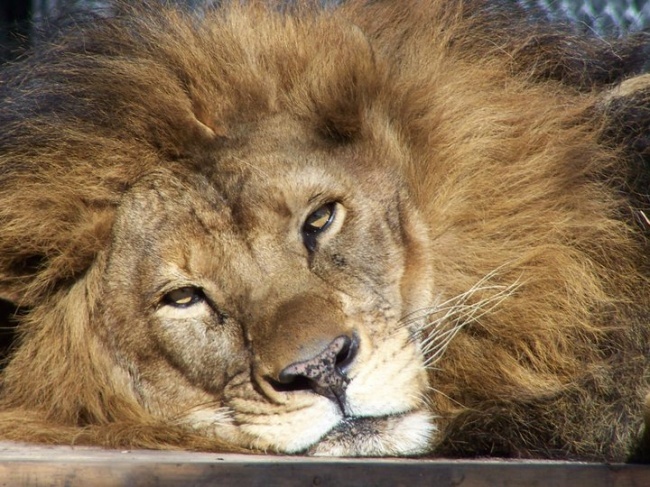 It’s no easy task to get a stubborn lion to take a whole bunch of antibiotics. Sheila was difficult and sometimes it would take an hour for the In-Sync team to get her to take her medicine. Immediately after Sheila started taking her antibiotics, she started feeling better. Pretty soon she was able to walk and eat on her own. Naturally, all of Sheila’s caretakers thought that the improvement in her health was due to the medicine she was taking, but in reality, she was getting better so quickly because of a completely different reason— one that nobody had noticed before. Sheila had a different kind of medicine. In a Facebook post, In-Sync stated, “Sheila has made a remarkable improvement. 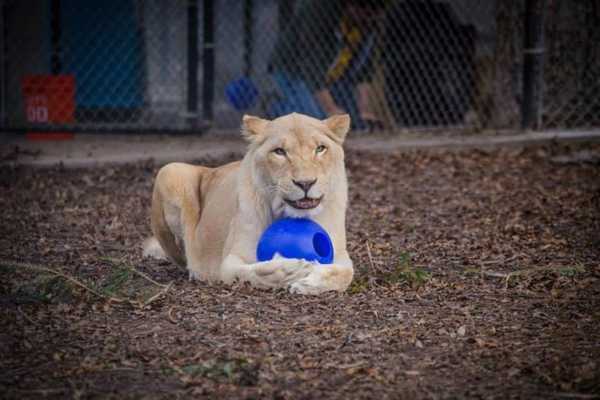 She has regained muscle control, swallows easily, and runs and hops like a bunny.” But even the handlers and caretakers who worked with Sheila every day weren’t sure why this lion who was previously so sickly was able to make such a quick recovery. Antibiotics are wonderful, but they couldn’t have restored Sheila’s will to live all on their own. The enclosure Sheila was living in at the In-Sync facility had another enclosure attached to it. There was someone in the enclosure next to Sheila’s that helped the lioness feel happier and healthier. When the employees at In-Sync discovered what was happening between the two enclosures, they were completely shocked. Keep reading to find out who Sheila’s helpful neighbor was, and why she bounced back so quickly. It was a lion! A very handsome male lion, to be exact. It seems like Sheila had developed a crush on her neighbor. From the very beginning, these two had formed a very close bond. Sheila’s love for Kahn was the reason she was able to progress so quickly. 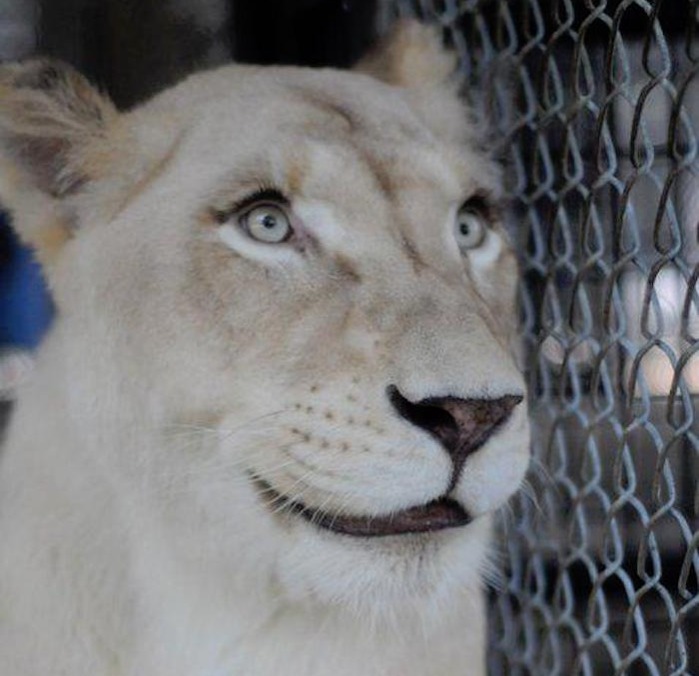 Now that she had a relationship with another lion, she had found the will to live. Also, Kahn had a similar backstory to Sheila. 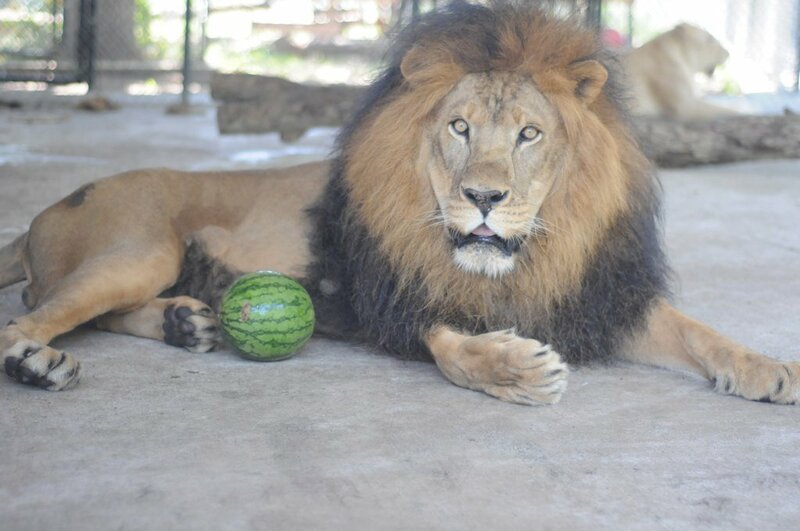 Kahn is a six-year-old lion who was rescued by In-Sync just a few months before Sheila’s rescue. 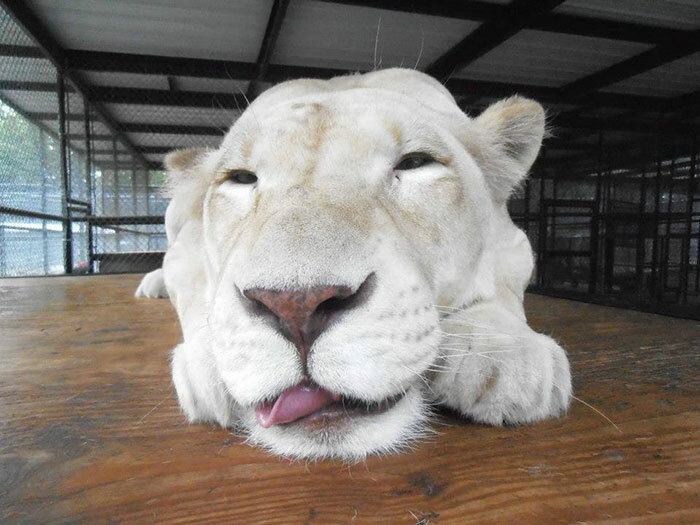 Like Sheila, Kahn was a lion who used to work in the entertainment industry in Texas. He was also mistreated by his handlers and when he arrived at the rescue facility, he was in very poor health just like Sheila was. Maybe these two were able to bond so quickly because they had lived through similar circumstances. Just like Sheila, Kahn was a show animal. 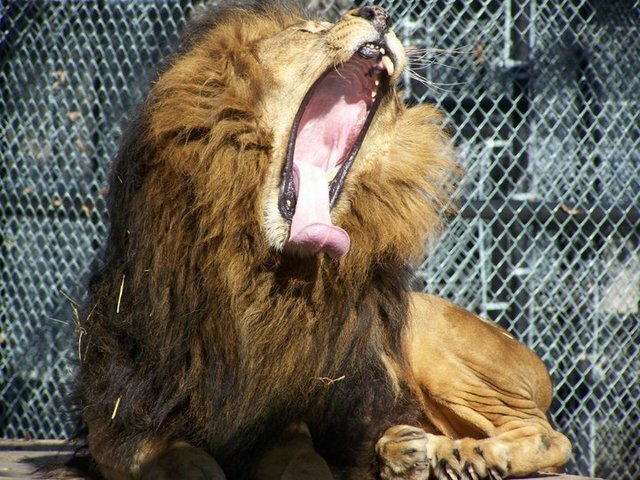 He used to entertain audiences in private parties by showing off his roar or balancing on his two back legs. His handlers took him to different events around the city, and sometimes he performed at multiple events or parties in a single day. All of that traveling and hard work made him sick, but he was still forced to perform despite his illness. When Kahn was finally rescued by the In-Sync team, he was in horrible condition. 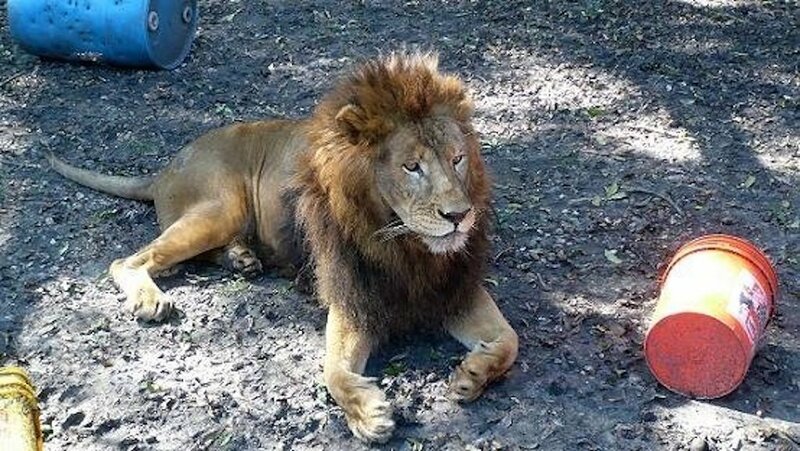 He was malnourished and weighed about 100 pounds less than the average lion his age. He had been beaten and overworked by his owner. 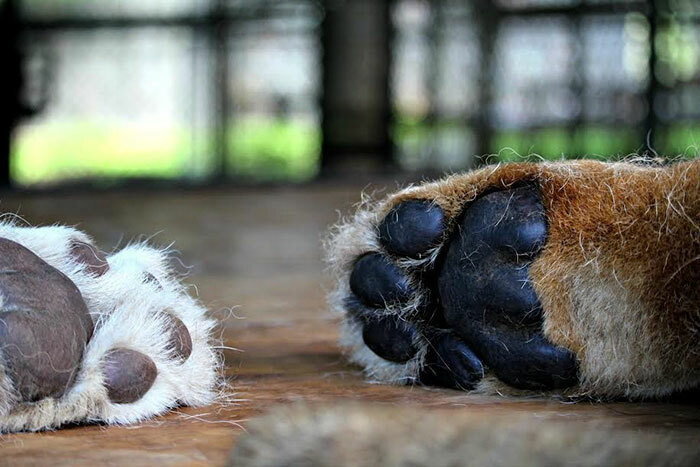 He was forced to live in a tiny cage that stunted his growth and compromised his bones. He became so frustrated with his living conditions that he did something totally unexpected. Because of the way he was treated and how he was forced to live, Kahn lion chewed his own tail off out of boredom and frustration. The tip of his tail had become completely raw and swollen. Had he not been rescued in time, he would have developed an infection and died. Keahey explained, “When Kahn came, the end of his tail was completely chewed off and [he] was very thin.” Kahn also suffered from bone problems that made it difficult for him to walk. 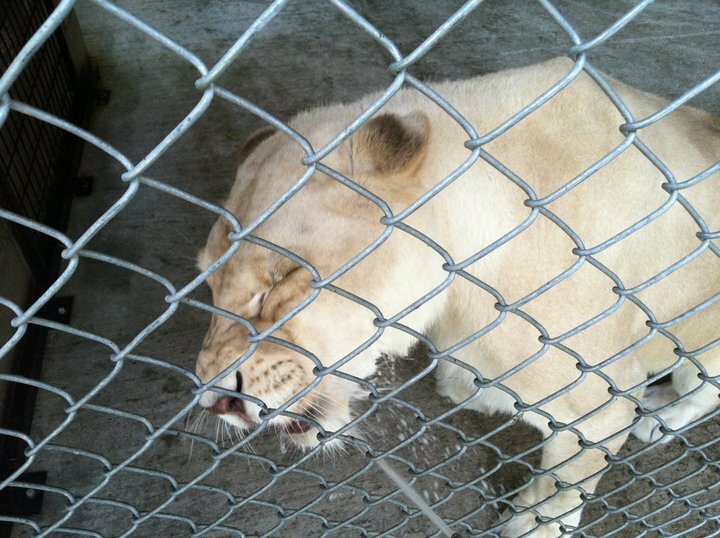 Kahn was very aggressive when he first came to the rescue center. It was very difficult for the In-Sync team to interact with him and to help him. Because he hadn’t been given enough food when he was living with his previous owner, he was very aggressive when it came to feeding time. In many ways, Kahn was a very dangerous lion. Workers had to use extreme care when feeding him or treating him. Kahn was a fighter, and unlike Sheila, he never lost his will to live. He was able to recover quickly and soon this aggressive beast turned into a calm and relaxed animal. 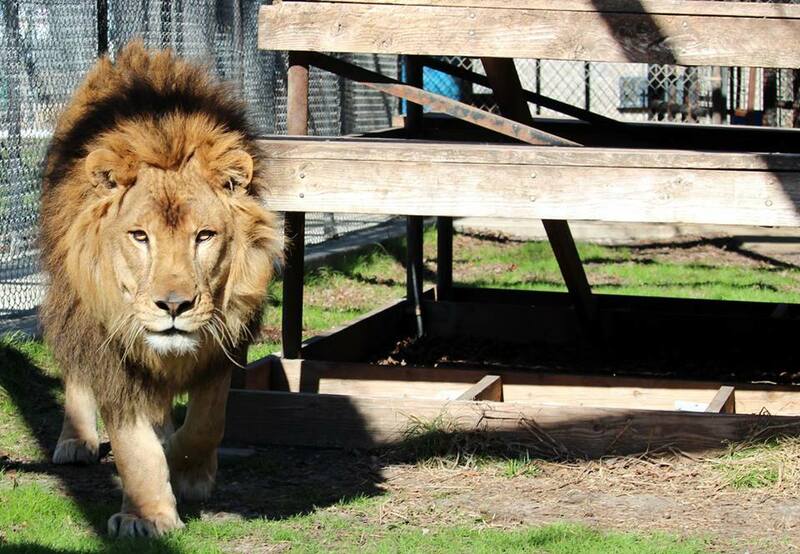 Kahn fit right in with the other lions at the rescue center, and he seemed to really enjoy his new life in retirement. His aggression was mostly an effect of his health issues, and now that his health issues are resolved, he is much less aggressive. Kahn felt right at home at the In-Sync rescue center. 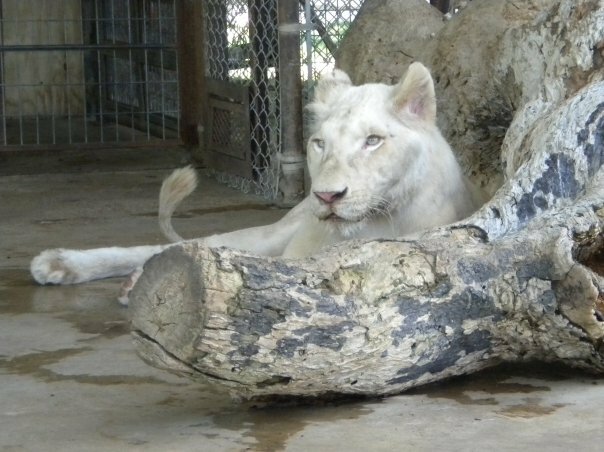 He became so good-natured that the workers at the center were able to build him some cinder-block stairs so that he could get into the den in his enclosure more easily. Now he had a lot more room to stretch out and relax. This place was a lot different from the small cage that Kahn was used to living in. Now Kahn just needed a friend to play with. 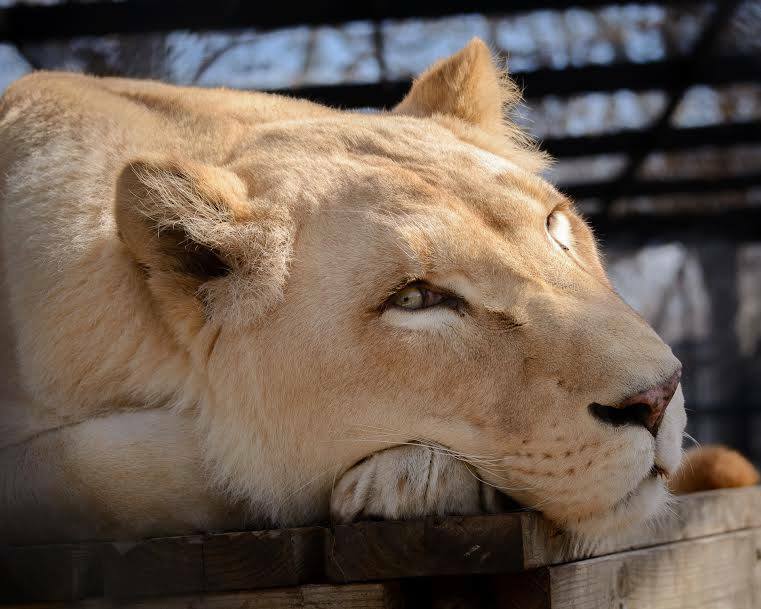 Lions are very social creatures who tend to live in packs (called prides), which is why it’s especially upsetting that both Kahn and Sheila were isolated from other lions for so long. As soon as Kahn and Sheila were placed next to each other they immediately developed a friendship. This friendship was the key to Sheila’s recovery. Kahn’s fighting spirit was starting to rub off on her. 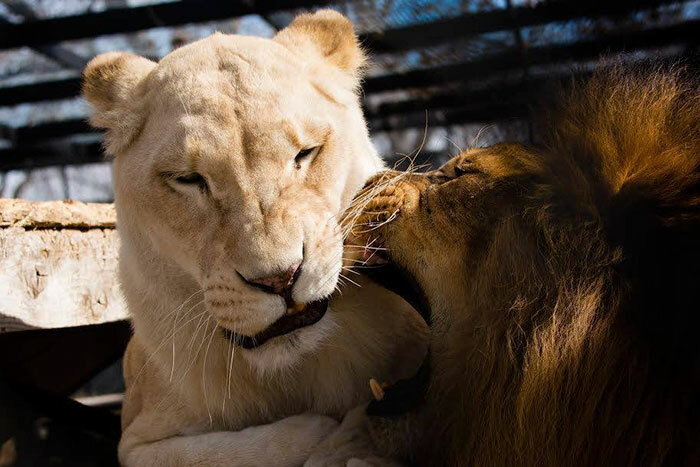 Both of these wild cats had gone through the same kind of tragedy, however, the situations of both were a little different. The in-sync founder explained ‘It was easy to treat him and get him comfortable with his new surroundings. 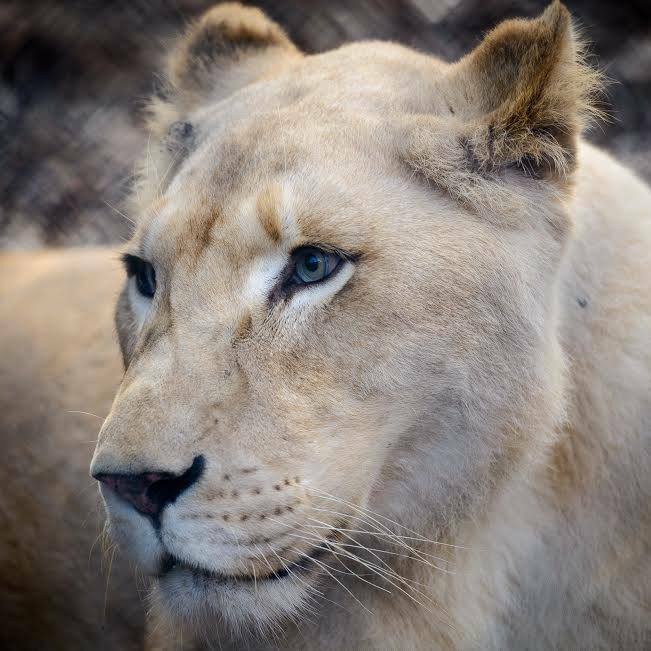 Sheila, on the other hand, was in very bad shape … Sheila was almost dead.” Even though these lions had both been through a lot of trauma, their different personalities caused them to respond to that trauma differently. These two were taking the next step in their relationship. Who knows where this pairing could go? 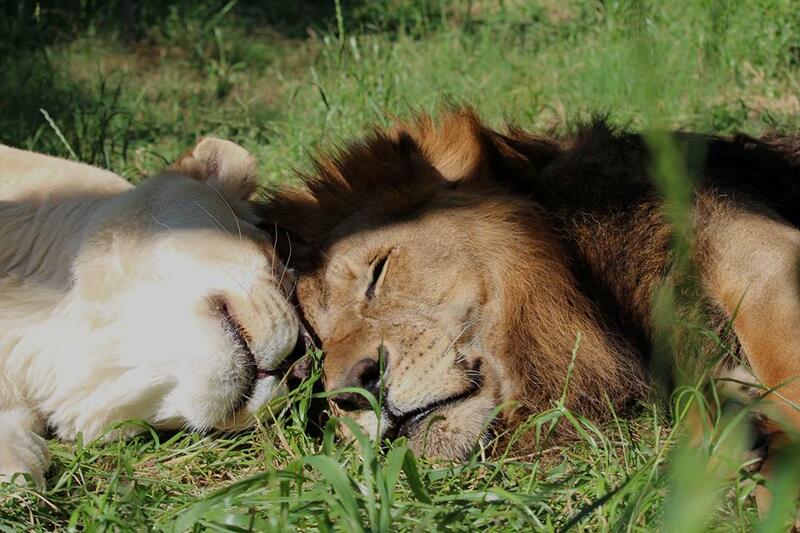 These two lions clearly had some kind of love for each other, that is if you believe that lions can fall in love. Have you seen The Lion King? They definitely can. 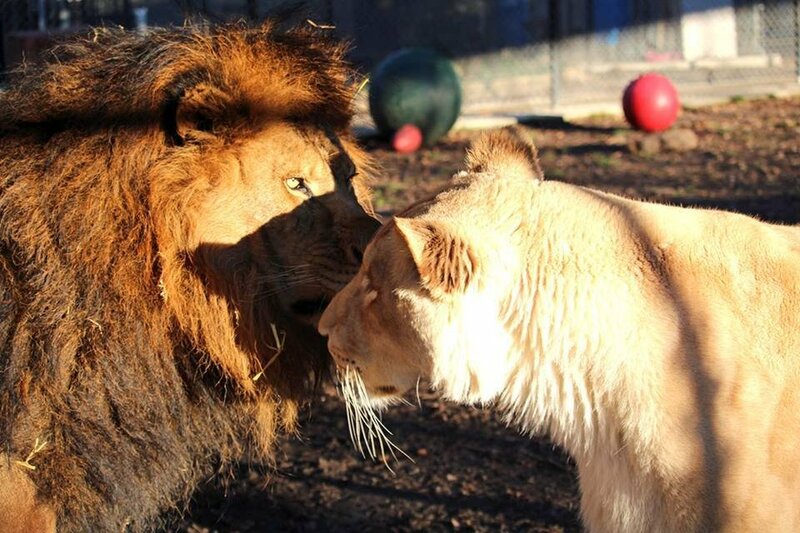 The workers at In-Sync saw that these two lions were clearly affectionate towards each other. They decided to let them date and to let them share an enclosure, but before they did that, they spayed Sheila so that there were no happy accidents. We don’t need any more lions born in captivity. These two are serious relationship goals. 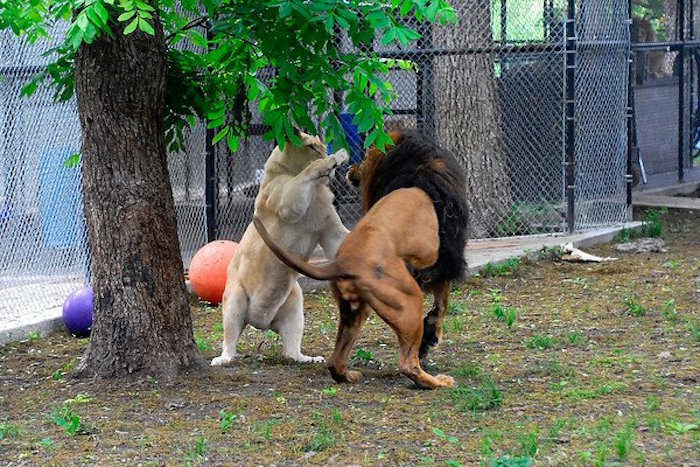 Everyone at In-Sync was so happy that these two lions found each other. Sheila and Kahn were finally happy and healthy. This newlywed couple can’t get enough of each other. Sheila is absolutely in love with her husband. 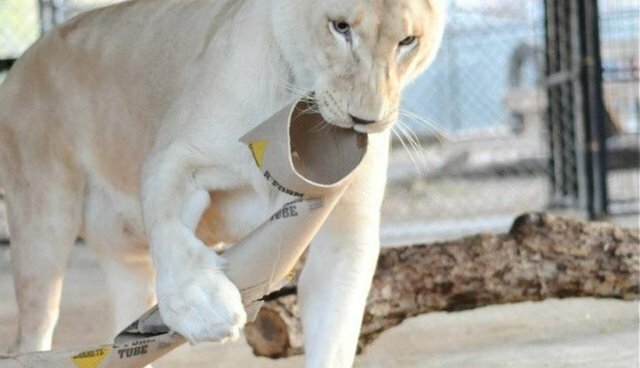 She also enjoys playing with cardboard boxes and getting a lot of attention from her caretakers. Vicky has revealed that Kahn is very possessive over his wife. 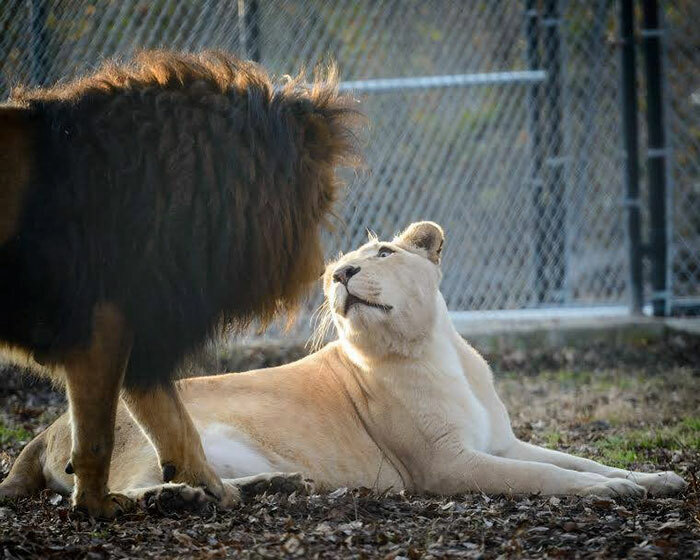 He gets very jealous when other lions look at Sheila and he does everything in his power to protect her. 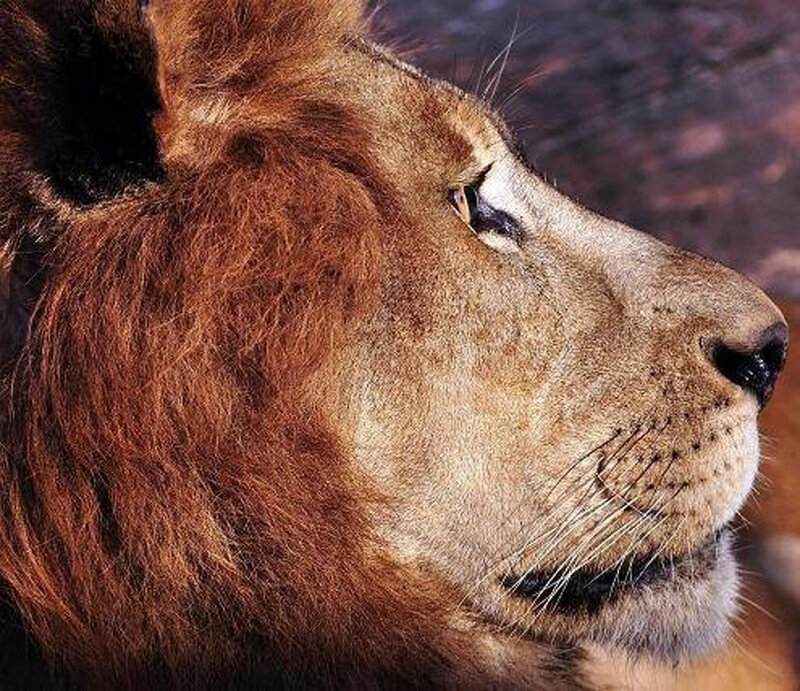 Keep reading to find out what Kahn does when another lion approaches Sheila. 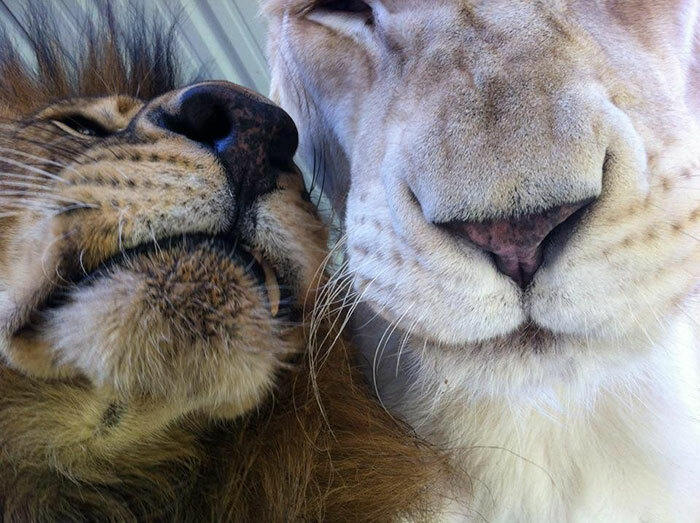 These two rescued animals make such a perfect couple. But what happened to the people who abused them? What are they doing now? 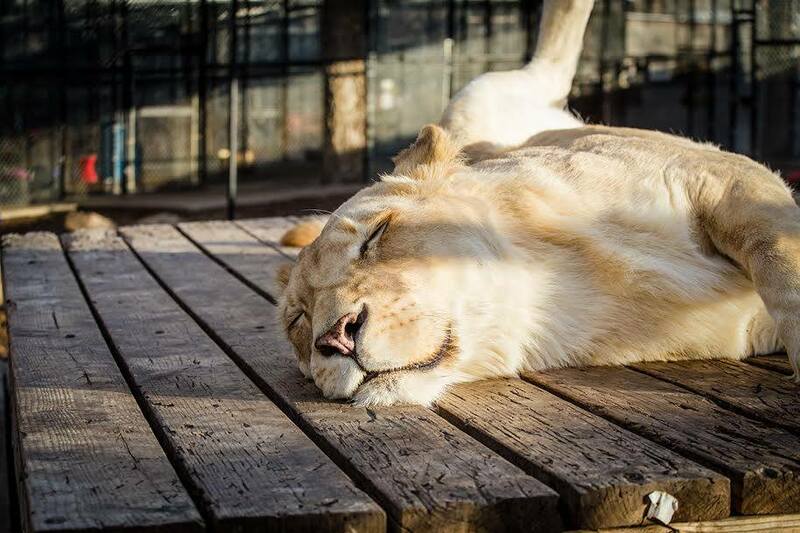 The man who abused Sheila, Kahn and other animals is no longer entitled to keep big cats or wild animals. He lost his ability to keep lions, which in turn affected his business and how much money he is able to make. However, some animal rights activists thought that this man should receive a more severe penalty. They thought he should spend time in prison or at least be fined for what he did to these magnificent creatures. 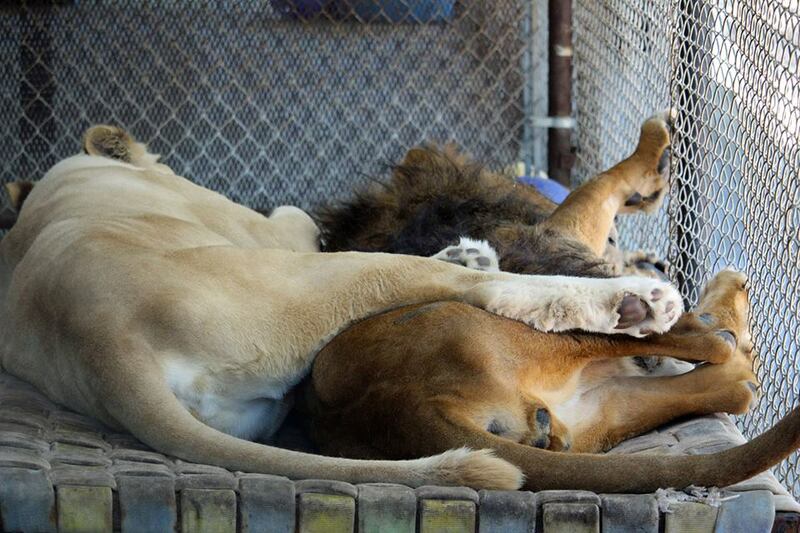 This story that started with animals in horrible conditions, fortunately, ended with some lion-sized love. 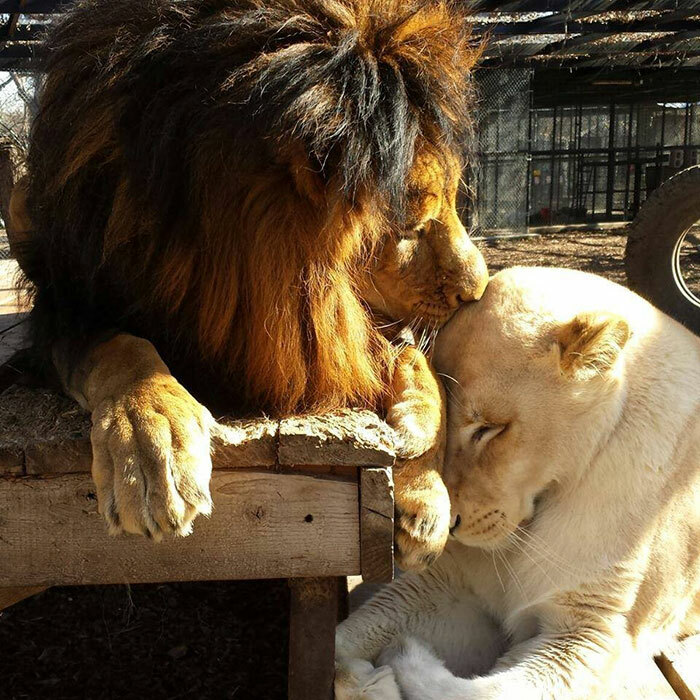 Sheila was almost euthanized, but now she gets to live out the rest of her life with her beloved lion husband. 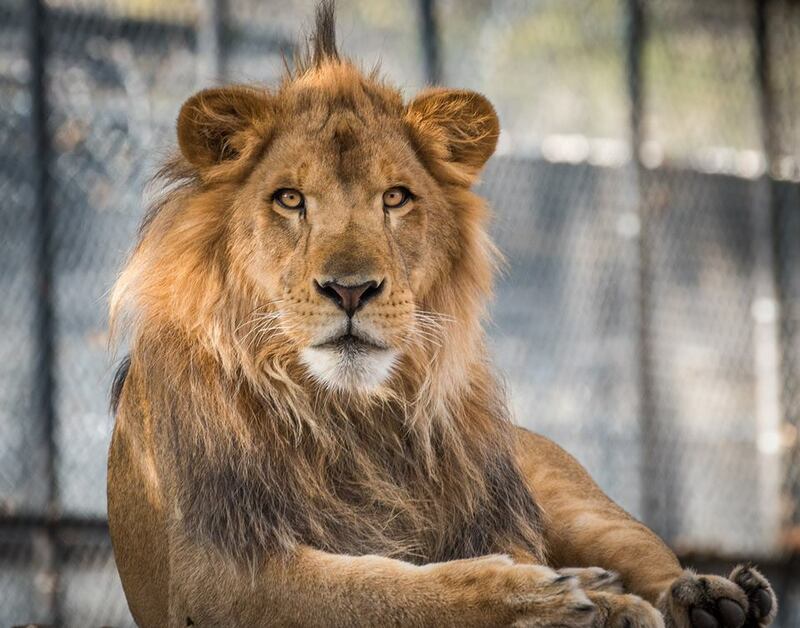 This story makes us believe in happy endings, and it makes us want to do everything we can to make sure that no more lions are stolen from their natural homes and overworked for human entertainment.